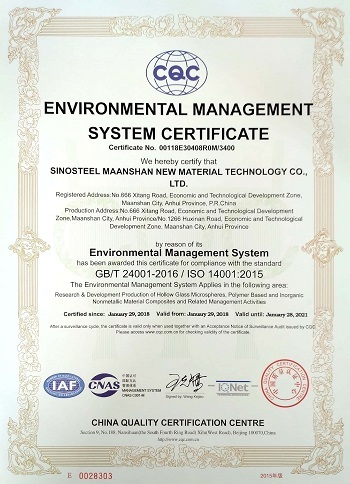 Compared with common mineral fillers with irregular appearance, SINOSTEEL hollow glass microspheres shows more excellent performance on terminal products. Since our product series have different density, particle size and crush strength, there are a widely of choices for you to solve urgent issues of many fields. 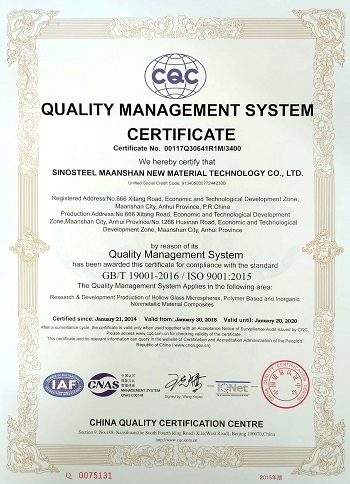 The company certified ISO9001:2015、14000、18000 quality assurance system,and continue to carry out effectively.The products of the company had acquired High and New Technology Product Certification in 2013, with the the certificate No. 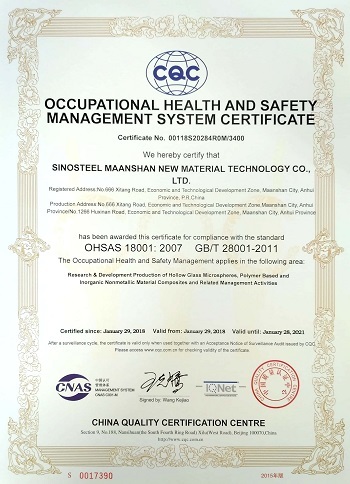 341013420168.We have the appropriate quality testing equipment, advanced detection methods, and specialized product development laboratory in the field of composite materials, coatings and oil fields etc..The product quality control covers the detection of raw materials, process control and product testing, and ensuring product consistency. Unlike the traditional industry sales model, we greatly make an emphasis on the products application technical support. We continuously provide technical training and our technical support will start from the customer’s product design, to after sale and service, feedback system on product quality.Our company establishes a good relationship with CAS and other institutes. We can provide an appropriate process and the right products ratio according to the actual needs of customers.Our company built a long-term strategic cooperation and technical support with well-known companies at home and aboard. We are not only committed to support and assist customers to know new products, but also know how to use new process and new technologies. Our products are easy to transport and store. The high—performance hollow glass microspheres produced by our company can be packaged with plastic boxes or texture bags and it can be transported in bulk by various ways. Packaging weight depends on the density level of the hollow glass microspheres and the actual needs from customers. In order to extend the storage time , it should avoid humid environment, and be stored in a cool and dry place. After opened, the bag should be firmly resealed. If the package is damaged during the process of shipment and storage, the damage bag should be replaced by a new on in time. For hollow glass microspheres, if the density is too low, the crush strength will decrease.Therefore, if you choose the improper grade, the effect of application maybe not good, it can influence the performance of terminal products, even costs a lot. There are significantly different influence on the technological conditions, product quality and production cost with different grades. Please take the above sheet for your reference, or consult our technical engineers to choose your most suitable grade. Since hollow glass microspheres are ultra-fine powder with medium alkaline, it will stimulate the respiratory tracts. If the hollow glass microspheres exposure in air for long time, you should wear a qualified mask or respirator.